The key to any successful ritual preparation is to alter your state of consciousness in order to break through perceptive filters which normally inhibit direct experience of and communion with spirits. Therefore the term purification in this case refers to a period in advance of a rite that supports the breaking down of these filters or attachments to everyday life. Similar to most elements in the tradition of the Magickal Grimoires, the actual means to purify our state of mind and living are heavily influenced by a Jewish-Christian worldview. The standard procedures involve multiple weeks of e.g. fasting, cleansing, prayers and isolation. I feel it’s important to point out, however, that the actual change brought forth by purifications happens in our hearts more than anywhere else. Whatever means we chose to purify our lifestyles, the real aim of the game is to change the state of our heart: Imagine we all had a compass in our hearts and the compass needle would normally be guided by our everyday affections, desires and fears. Then the purification rites are what replaces the magnetic field of our personal desires with a field of devotion to God or the spirits we summon. The foremost goal of purification rites is to change the intention of our hearts. Hitlawut: is the flare, it is the zeal of ecstasy. A flaming sword guards the path to the tree of life. It sputters on the touch of Hitlawut. Awoda: is devotion. If Hitlawut is the mystical feast, Awoda is the mystical sacrifice. All deeds bound into one and eternal life embedded into every action. Kavanah: is the mystery of a soul directed towards a single goal. Shiflut: is humbleness. It is the awareness of the uniqueness of each aspect of creation. It is the awareness that doesn’t compare two things but surrounds each of them with the love it deserves because of what it is alone. Now, before I started to perform the ritual I thought this was a pretty solid approach to changing the intention of my heart. And it was. But I forgot about everything outside of it. When I cleaned and prepared my temple on the morning of that day I forgot to realize that the atmosphere in it was cold and damp from the long winter months during which it hadn't been used. I did realize a lot of large spiders and white cobwebs behind the black curtains - but here we are living on the countryside and I guess building a temple into an old barn will always come with these types of silent visitors. Yet, what I overlooked was that the presence of spiders and cobwebs should have pointed me to the astral state of my temple: the energy was low and there were certainly some astral cobwebs on the curtains. I should have purified it by burning menthol crystals and performed a ritual cleansing of the entire sacred space. 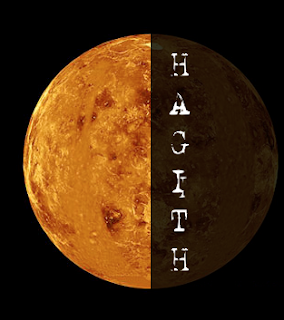 Perform a ritual act to revive the energies sleeping in the astral patterns of the temple so that they would actively vibrate and resonate when I entered for the Hagith rite at night... I took this as a deep learning and hope not to repeat it too soon: as a magician it is just so easy to become overly focussed on ourselves and forget about the world we are living in.